The Summernationals at Western Sydney International Dragway, Sydney Australia saw the quickest field in history of ANDRA Top Doorslammers, and John Zappia couldn’t believe the final result. Despite running a third consecutive five-second pass in eliminations, Maurice Fabietti snuck home by a whisker to take out the event. Qualifying for the Zappia Racing Team was full of drama after an engine change was required. The PSI 3,000 horsepower engine broke a rod after lifting in the braking area, causing Zap to slip and slide to rest sideways on the oil from the big hole in the sump. Round one saw Benny Bray put champion Garry Phillips away with a 6.086et @ 235.64mph to a slowing 10.339et @ 83.23 from Garry, ending Phillips weekend of Summernationals racing. Brett Stevens was on fire against Robin Judd next, running an impressive 6.022et @ 243.90mph against Judd’s pedaling 6.277et @ 239.01mph. Zap came out next against Steve Stanic and shut the door with a crowd raising 5.951et @ 239.14mph to a 6.028et @ 235.72mph. Not to be out done, Deno Brijeski rattled off another monster 5.991et @ 239.65mph run, but was too slow on the lights and a jubilant Maurice Fabietti took the win with a 6.105et @ 237.88mph. The turnaround in the Zappia Racing pit was busy, busy after a compression check discovered a dropped valve. As usual the crew thrashed and managed to replace a piston, liner and head in record time and lined up for round two in front of a record crowd. First out in round two were the pairing of Benny Bray against an improving Fabietti. Fab took the win with a 6.037et @ 231.12mph as Benny shook and rolled through for a 9.639et @ 146mph. Zap took on danger man Brett “The Boss” Stevens next and ran an amazing 5.999et @ 241.41 after a pedal, as Brett shook and pedaled for a 6.379et @ 231.12mph. The final was held at 10.30pm on a cool, crisp night in Sydney with the temperature at 19 degrees Celsius. ”We were seeing some exciting possibilities in the tune as we learn more about this PSI combination, and I knew I could do a five in the final” said Zap. “Anything was possible in the final though based on the racing so far”. Fabietti ran a 6.000et @ 240.86mph to Zap’s 5.958et @ 240.21mph to make it the quickest side-by-side Doorslammer pass in Australia. The Zappia Racing Team will head back to hometown Perth for Round Three of Top Doorslammer on 1st – 2nd March at the Perth Motorplex’s biggest event – the 2008 37th Chill Westernationals. Zap the man to beat. Nineteen of Australia’s quickest Doorslammers descend on Sydney, New South Wales this weekend for the annual Summernationals, all keen on reining in the quickest man – John Zappia. 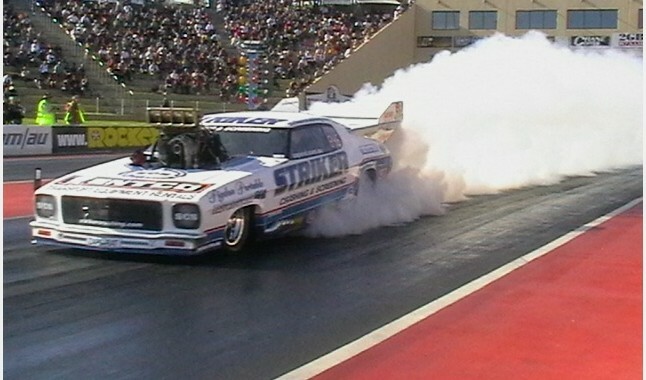 Zappia leads the ANDRA Top Doorslammer Championship in the Striker Monaro with 343 points, after two wins and a runner-up in the first three rounds. Steve Stanic follows on 240 points, rookie Stuart Bishop on 185 points, and a group of the heavy hitters in Gary Philips, Ben Bray, Brett Stevens, Victor Bray and Robin Judd close behind. The current season has seen the Striker Monaro leading the field in qualifying, displaying solid reliability and consistency in the low 6 ‘0’s, and running three stunning five second passes that wowed the crowds. “I am able to manage our team and logistics better now that I am a full time professional racer. Force Tools coming on board as a major sponsor, and supplying the team with a full range of their excellent hand tools and boxes has made the job easier for the crew”. “Drag racing is a tough sport, and some times things really come together in a big way for a team and a car. Just look at Victor Bray’s rein as Top Doorslammer champion for all those years in Australia. We are enjoying our racing more than ever, and are constantly looking for new ways to go quicker and faster and build on our momentum”. “The weather in Sydney this weekend will play into our hands, as we have a 5.965 tune from the AC Delco East Coast Nationals here at WSID last September, where the conditions were very similar. We can add a little from what we learnt in Perth at the Goldenstates, where we went 5.956, and that should give us a pretty quick car”. The nineteen Top Doorslammers will contest the three qualifying rounds on Friday night, all hoping to make the eight-car field for eliminations on Saturday night.